We are a small Canadian soup company, who specializes in full flavoured soups that are good for the soul! We love good quality food. Our Italian values in food would not let us provide anything less. All of our soups are home-inspired, but created in our kitchens to enable each Canadian to savour delicious, nutritious and simple yet hearty food. Every single one of our soups has been created to deliver a unique consumer flavour experience. Today’s lifestyle is fast-paced, hectic and often referred to as the lifestyle of rise and grind. Finding healthy meal solutions on-the-go or at home after a long day is a real challenge. At Primo, we happily provide you with the homemade recipe for each of our soups, so that you could cook it at home from scratch. 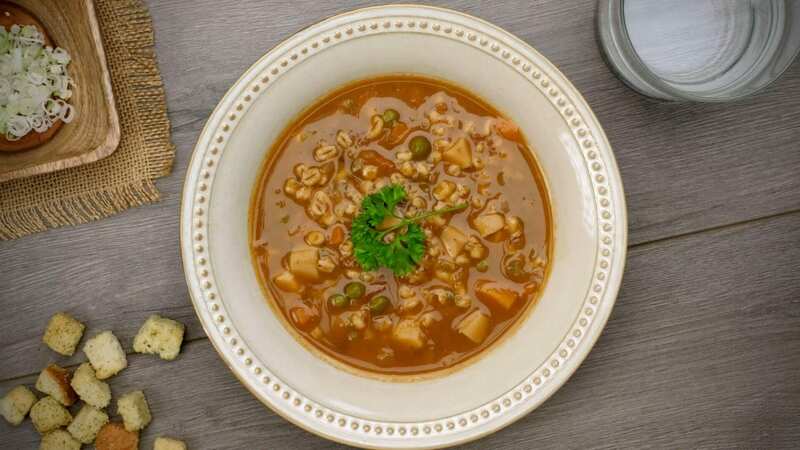 However, when you don’t have the time and you are looking for a healthy, hearty meal, we offer our “homemade simple” soups that you simply heat and serve. We combine our carefully selected ingredients and our slow cooking to create flavourful and delicious soups with the convenience of your kitchen cupboard. We buy our ingredients locally, wherever we can and in the USA when seasons may not co-operate. We make 100% of our soups in Canada, with our chefs carefully adding the ingredients to achieve the right texture and flavour every time. Variety of garden vegetables. Ingredients like carrots, green lentils, red beans and green peas are all sourced locally here in Canada. The vegetables that are chosen add nutritional value contributing to a healthy diet. Roma tomatoes sourced in Ontario. The same premium quality tomatoes that are used in Primo pasta products. Carefully grown and ripened for that straight-from-the-garden juicy delicious taste. Starch. A hearty soup is not complete without potatoes. Potatoes are sourced by season in Canada and the USA so that our soups are made with the freshest, most flavourful produce available. Protein. Our experts work full-time ensuring that our protein choices (lentils, chicken and beef) are of the highest quality and are sourced from only the best farms across Canada and the USA. 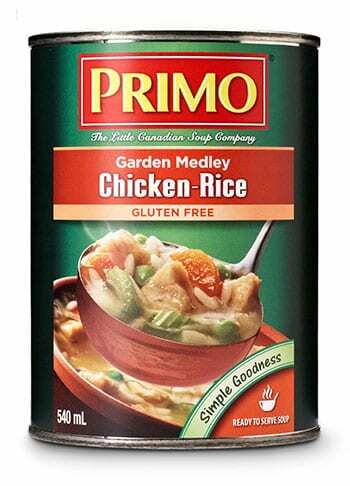 These efforts ensure that each and every Primo soup is rich in flavour and is the closest thing to homemade that you'll find in the soup aisle. Our secret is two-fold. We slow cook our soup in batches to ensure that each batch and recipe gets our individual attention. Every recipe is simmered until the broth is just right and then we start to add the vegetables and other ingredients until the soup has reached its peak flavour. No two batches may be exactly identical but we make sure that we have absolute consistency in the flavour and texture every time. 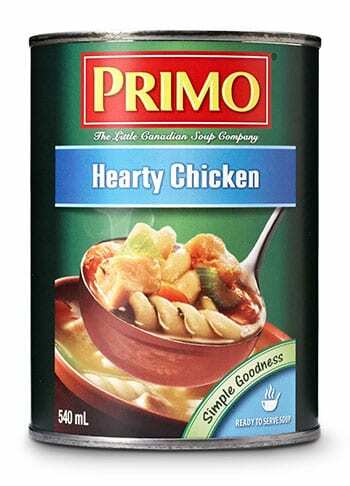 At Primo, we do the slow cooking and simmering of the broth so all you need to do is heat, serve and enjoy without compromise. That’s why we call it homemade simple. At Primo, we understand that our consumer’s tastes are like snowflakes – no two are exactly alike. That’s why we made our homemade simple soups so they can be enjoyed either on their own as heat-and-serve, or used as a base for more unique, home-inspired recipes. With all of our home-inspired recipes, feel free to add your favourite extras, fresh Parmesan cheese, vegetables, other meats or spices. Any one of our soups can become your own expression by simply adding a couple of simple ingredients. 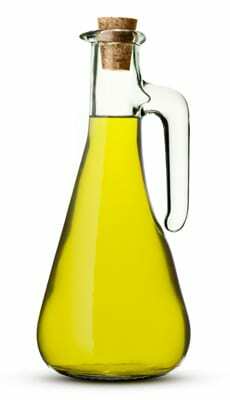 Just a few drops of fresh virgin olive oil or lime juice, even sherry or dry wine, are all you need to add richness and complexity to the soup. 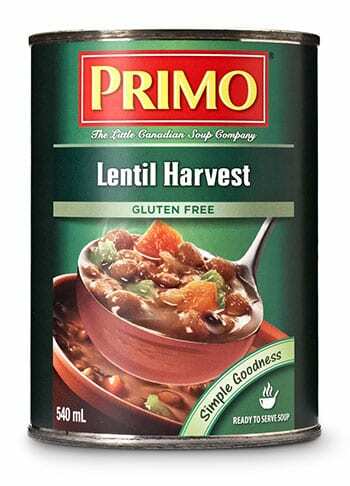 Olive oil compliments leaner soups, and wine adds a more robust flavour for a heartier soup. 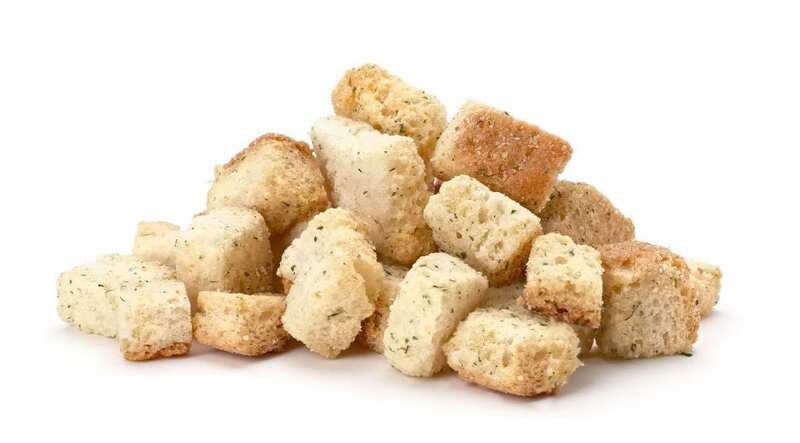 Adding texture to the experience: Croutons or tortilla chips are an excellent way to add both flavour and texture to your soup. A hint of fresh garlic makes a welcome addition to any of our classic Italian recipes. Adding seasonings can take a recipe from a simple everyday soup, to a new dimension of exotic flavours. While black pepper can add heat and depth to any of our soups, paprika, rosemary or thyme are just some of the many interesting flavours that can take your soup to a whole new level. 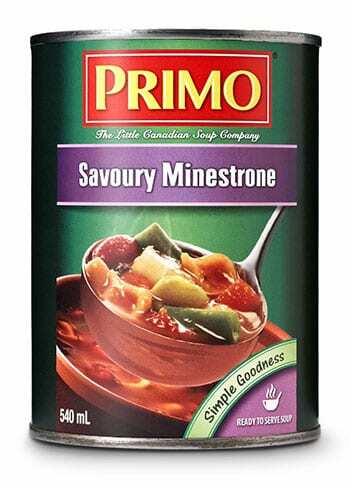 Click on your favourite Primo Soup to discover our soup-specific pairings. We also happily provide you with the homemade recipe for each of our soups so that you can cook it at home from scratch. We would love you to share your own inspirations with us (click here) and we will share ours with you..